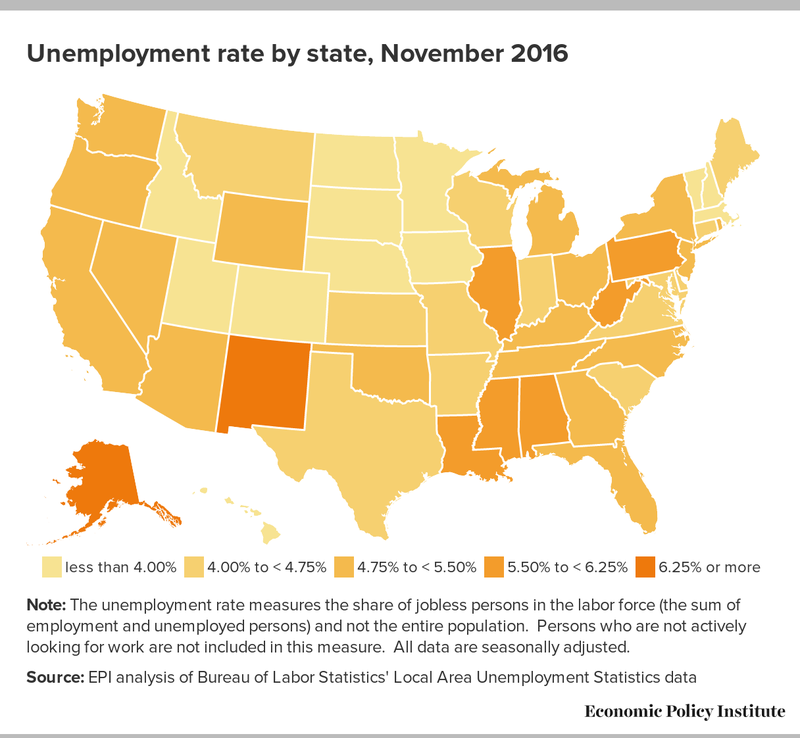 The November state jobs data, released Friday by the Bureau of Labor Statistics, shows most states on pace to continue their sluggish recoveries through the final months of the year. Mirroring national trends over the past quarter, a majority of states continue to add jobs and see declining unemployment rates. In most states where unemployment rates increased, the labor force grew— hopefully indicating a return to the labor market for previously discouraged job-seekers. From August to November, 32 states and the District of Columbia added jobs, with the largest percentage gains occurring in Montana (+1.4 percent), West Virginia (+1.4 percent), Washington (+1.1 percent), and Nebraska (+1.0 percent). Over the same period, 18 states lost jobs. Vermont (-1.0 percent), Alaska (-0.9 percent), Connecticut (-0.6 percent), Iowa (-0.5 percent), North Dakota (-0.5 percent), and Oklahoma (-0.5 percent) experienced the largest losses. 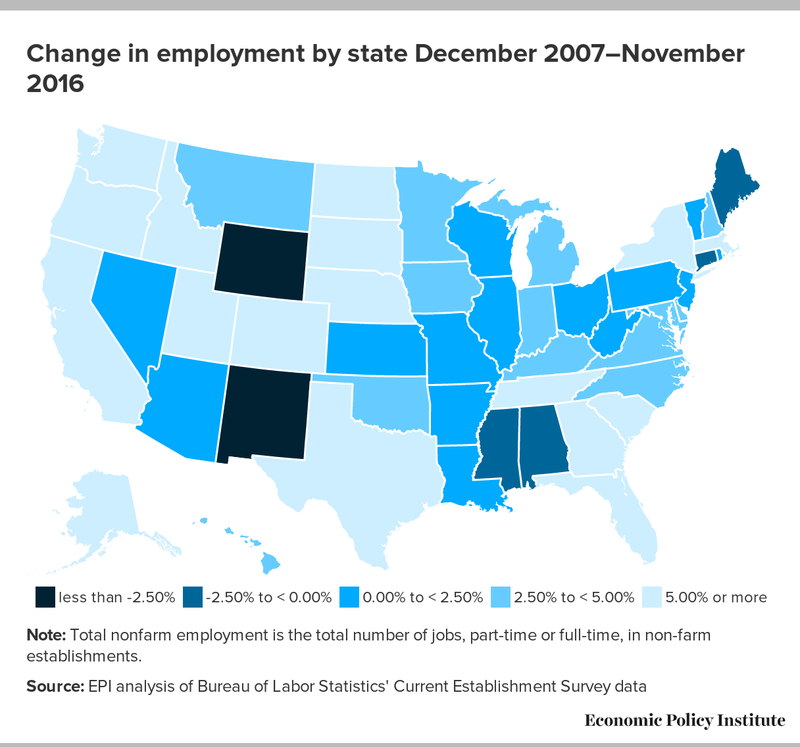 As of November, seven states (Wyoming, New Mexico, Alabama, Mississippi, Connecticut, Maine, and New Jersey), are still below their pre-recession employment levels. The unemployment rate declined in 29 states from August to November. The largest declines occurred in Nevada (-1.1 percentage points), Massachusetts (-1.0 percentage points), Connecticut (-0.9 percentage points), Arizona (-0.8 percentage points), and South Carolina (-0.7 percentage points). At the same time, there were increases of no more than 0.5 percentage points in the unemployment rate in 14 states, and no significant change in the unemployment rate in eight states. Over the past year34 states have had declines in their unemployment rates and 15 have had an increase of no more than 1.0 percentage points, and two had no significant change. As of November, 23 states and the District of Columbia still have higher unemployment rates than at the beginning of the Great Recession. In the months ahead, policymaking at the federal level may require states to step up their efforts in pursuit of a full recovery. The Federal Reserve’s recent decision to raise interest rates is an unfortunate setback, dealing a blow to potential wage growth for low and middle-wage workers in states that have yet to reach full employment. Policymakers would be wise to adopt a real agenda for working people that creates jobs, raises wages, and addresses long-standing inequalities includes an increase of the minimum wage, paid sick and family leave, and elimination of discrimination in hiring.